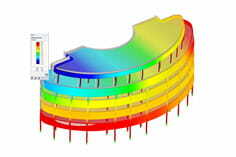 I read in an IFC file from another CAD program in RSTAB or RFEM using the CAD / BIM option. When converting, I get error messages. Likewise, the bars are not converted correctly. 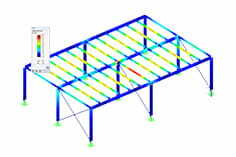 CAD programs, which are not primarily static design, usually map structural elements as solids. A simple rectangular support would therefore consist, for example, of 12 lines and 6 surfaces (see picture). The volume can also be defined differently. Either over the boundary surfaces (BREP) or as a so-called "pulled-up body" (Swept Solid). The difficulty now is to generate a 1D element from this 3D element. This is usually only possible if the solids were created as Swept Solid. The "face" area defines the cross section. About the direction and length of the extrusion, we can read the correct Stablage. In your case, however, it is a BREP. For this type, we currently can not ensure the correct conversion. It also refers to the warning that should appear when importing.